1. Some "read-only" must have their identification number written into the silicon microchip at the time the chip is made. The process of writing the number into the chip is called "factory programming". This data can't be written over or changed. 2. The programming of information into a tag occurring as part of the manufacturing process. 1. 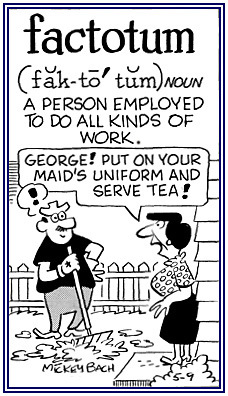 Anyone whose job is to do many different activities for someone else or a servant who is employed to fulfill various functions: Karl was a factotum or "jack of all trades" who was expected to perform all kinds of tasks for his employer. Adam has been a highly paid employee for several years as a reliable and skillful factotum because he is a skilled individual who can efficiently perform many different kinds of work for his company. 2. 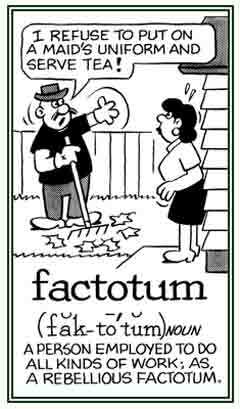 Etymology: from Medieval Latin (A.D. 700 to 1500) factotum, "do everything"; from fac, facere "to do" + totum, "all". © ALL rights are reserved. 1. Something that has been decided on and accomplished and which is usually an irreversible deed or an unalterable action: By the time the people heard about the increase in local taxes, it was already a fait accompli. 2. 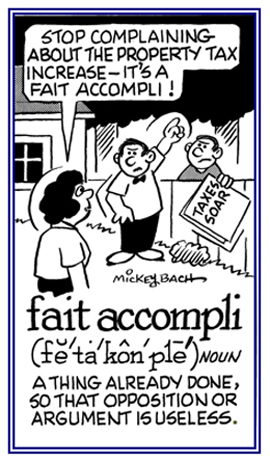 Etymology: from French, fait, "fact" + accompli, "accomplished"; literally, "accomplished fact". © ALL rights are reserved. 1. A willful perversion of facts or a deliberate misstatement or misrepresentation: Sam Black was arrested because there had been a falsification of some of his legal documents. 2. The intentional alteration of a record, an account, or any document, so as to render it untrue: The clerk, Mrs. Thomas, thought she could get away with the falsification of the financial records. Falsifications occur more often in insurance and real estate contracts and false advertising is also considered to be misrepresentations or falsifications. Sometimes a contract that contains or constitutes misrepresentations may be considered to be a deliberate falsification. 1. That which was proven to be untrue or to be untrustworthy: The falsified loyalty of Rick turned out to be a serious shock to Monica, his wife. 2. A reference to having been forged or having given a deliberately deceptive appearance to something: The financial report turned out to be a falsified document. 1. Someone who makes changes in a report in order to make it incorrect or untrue: The police were sure they had the right person who was the falsifier of the financial statements. 2. People who make erroneous statements or who misrepresent themselves: The economic advisor was a falsifier who deliberately fooled investors who trusted him. 3. Anyone who counterfeits or who gives something a deceptive appearance: The counterfeit artist was actually a falsifier who created paintings of famous artists himself and claimed that they were the actual works of other painters. Showing page 13 out of 42 pages of 624 main-word entries or main-word-entry groups.